A yeast infection is a symptom of an imbalance and/or immune system dysfunction no matter where or how it manifests. For this reason, the first thing you need to do when coping with a yeast infection is make any necessary changes to your diet that will support you in consuming healthy, natural, whole foods. Eliminate processed foods from your diet, as well as all refined sugar. Do not drink alcoholic beverages, soft drinks or sugary juice drinks. Instead, eat lots of fresh, whole fruits and vegetables, lean sources of protein and a small amount of whole grains. Drink pure, filtered water and natural herbal teas that have anti-fungal, anti-yeast properties. Lemon-grass, Pau d’ Arco and green teas are good examples. All mint teas also possess anti-fungal properties. Yeast infections on the skin are usually worst in areas of skin that do not get good ventilation. If you are very overweight so that you have persistent skin folds, you must take steps to remedy this situation. Eating a natural, whole foods diet will help. Additionally, you should be sure to keep your skin clean by using natural, chemical free, soothing soap when bathing. 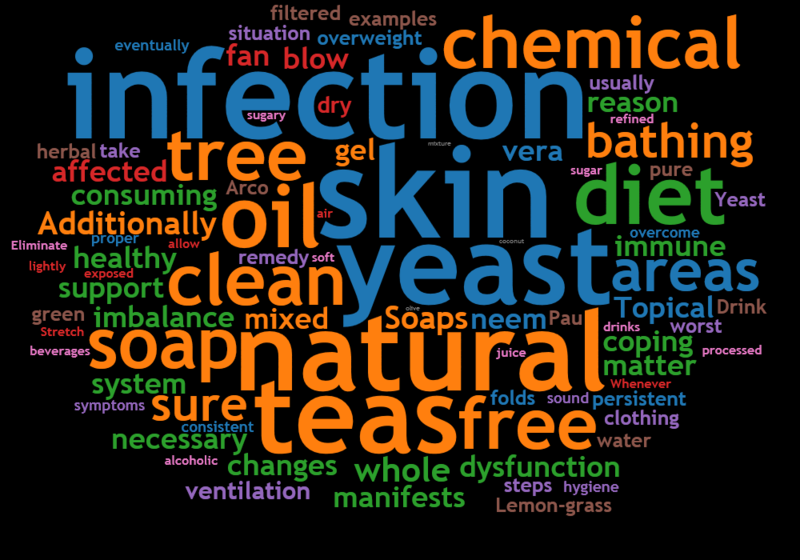 Soaps made with oil of lavender, eucalyptus and tea tree oil have strong anti-fungal/anti-yeast properties. Be sure to dry off thoroughly after bathing or showering. You may wish to use a blow dryer or fan to dry areas affected by yeast. Topical application of aloe vera gel with a few drops of tea tree, lavender and/or neem oil mixed in will help fight yeast and fungus. If your skin is dry, you can add a bit of olive oil or coconut oil to this mixture. These oils also possess anti-fungal/anti-yeast properties. Whenever you can, allow your skin to be exposed to air. Stretch out and let a fan blow lightly on the affected areas. Always wear loose fitting, well ventilated clothing made of natural fabrics. With consistent application, sound diet, good hygiene and proper clothing will eventually help you overcome symptoms of yeast infection on your skin.